Married Name Her married name was Salazar. Paula (?) married Feliciano Salazar. Paula (?) died after 1976. Feliciano Salazar married Paula (?). Feliciano Salazar died before 1976. Faustino A. Marquez married Lorenza Ramirez, daughter of Santiago Ramirez and Petra Rosales. Faustino A. Marquez was born on 13 July 1914. He died on 19 November 1987 at age 73. Richard Pendergraft married Lu Ella (?). Married Name Her married name was Pendergraft. Lu Ella (?) married Richard Pendergraft. Name Variation Beryl Witte was also known as M. Beryl. Beryl Witte was born circa 1909. She was the daughter of John Joseph Witte and Mabel C. Lowry. Beryl Witte died on 19 July 1958. Harley Gay McCasland married Caldedonia Buster. Married Name Her married name was McCasland. Caldedonia Buster married Harley Gay McCasland. Married Name Her married name was (?) Boone. (?) McCasland was the daughter of Harley Gay McCasland and Caldedonia Buster. (?) McCasland married Joseph H. Boone. Joseph H. Boone married (?) McCasland, daughter of Harley Gay McCasland and Caldedonia Buster. Charles Whitley was born circa 1906 at Illinois. He was the son of Murty Alford Whitley and Olive Viretta Kennedy. 3 May 1910 Atlas, Pike, Illinois Charles Whitley was listed as a son in Murty Alford Whitley's household on the 1910 Census at Atlas, Pike, Illinois. [S243] U.S. Federal Census 1920 U.S. Federal Census, by Ancestry.com, Year: 1920; Census Place: Cuivre, Pike, Missouri; Roll: T625_941; Page: 2B; Enumeration District: 138; Image: 787. Willis Whitley was born circa 1907 at Illinois. 3 May 1910 Atlas, Pike, Illinois Willis Whitley was listed as a son in Murty Alford Whitley's household on the 1910 Census at Atlas, Pike, Illinois. Name Variation Murty A. Whitley was also known as Myrtie. Murty A. Whitley was born on 21 November 1908 at Illinois. Murty A. Whitley died on 15 December 1980 at age 72. 3 May 1910 Atlas, Pike, Illinois Murty A. Whitley was listed as a son in Murty Alford Whitley's household on the 1910 Census at Atlas, Pike, Illinois. Lola Whitley was born circa 1914 at Illinois. She was the daughter of Murty Alford Whitley and Olive Viretta Kennedy. Russell Whitley was born circa 1916 at Illinois. [S250] U.S. Federal Census 1930 U.S. Federal Census, by Ancestry.com, Year: 1930; Census Place: Saverton, Ralls, Missouri; Roll: 1219; Page: 16A; Enumeration District: 0010; Image: 943.0; FHL microfilm: 2340954. Stella Whitley was born circa 1919 at Missouri. 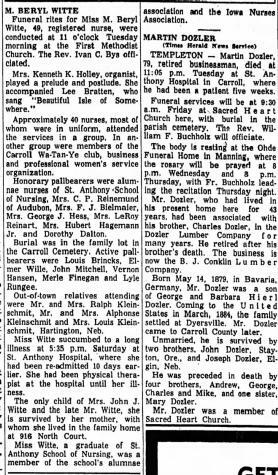 Married Name 29 August 1948 As of 29 August 1948,her married name was Friede. Betty Lou Breitkreutz was born on 14 October 1929 at Council Bluffs, Iowa. She was the daughter of Vernon Breitkreutz and Alma (?). 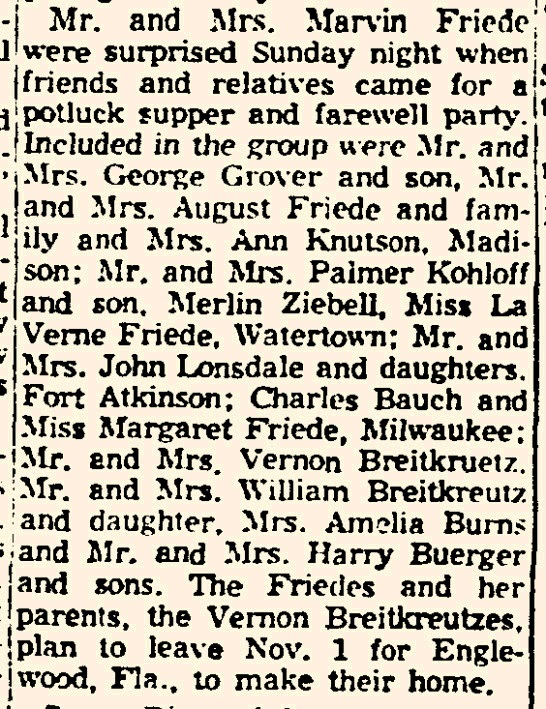 Betty Lou Breitkreutz married Marvin A. Friede, son of Arthur William Friede and Violet Anna Breitzke, on 29 August 1948. Betty Lou Breitkreutz died on 14 October 2014 at age 85 Betty L. Friede 85, of Englewood, Florida, died October 14, 2014. She was born October 14, 1929 in Console Bluffs, Iowa to Vern and Alma Breitkreutz. She moved to the Englewood area in 1955 from Wisconsin. Betty spent the summers in Cleveland, Georgia at Mountain Lakes and wintered in Englewood. She is a member of Englewood United Methodist Church. Betty was a Sunday School Teacher at Green Street Church and worked at Lemon Bay Drug Store on S.R. 776 for 23 years. She loved the Atlanta Braves Baseball Team and bird watching. She is survived by her husband of 66 years, Marvin; daughter, Susan Newberry of Englewood, son, Gerry ( Luann) Friede of Middleburg, Florida; grandchildren, Teata Bonfiglio, Eben Barnes and Billy Newberry; Great grandchildren, Spencer, Zach, Dylan and Emma; her Aunt Betty Ward. 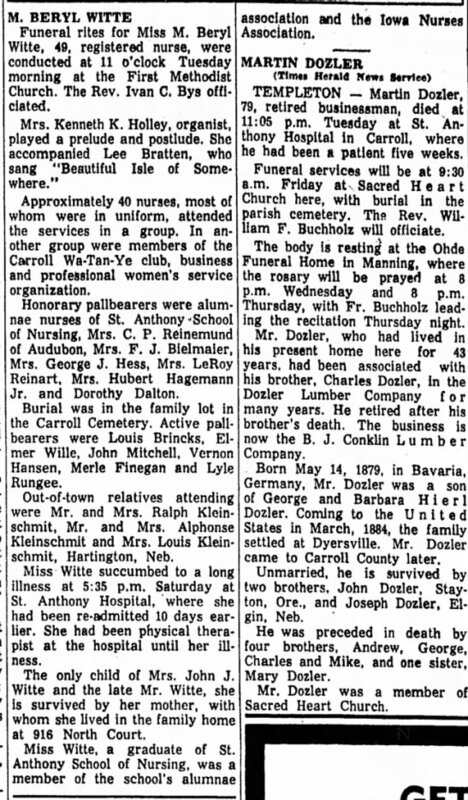 She was predeceased by her twin brother, Billy Breitkreutz and her sister, Hazel Cagwin. You may express your condolences to the family at lemonbayfh.com. Lemon Bay Funeral Home and Cremation Services is in charge of arrangements. 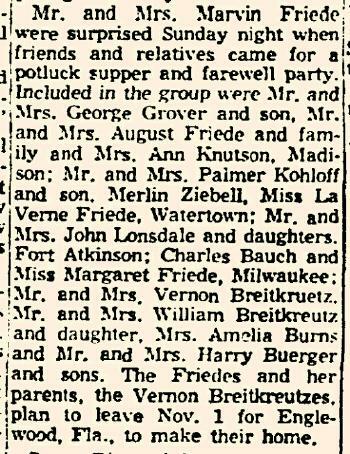 In October 1955 at Wisconsin Suprise party for Marvin and Betty (Breitzcruetz) Friede who are moving to Florida with her parents. Name Variation Vernon Breitkreutz was also known as Vern. Vernon Breitkreutz married Alma (?). Major Frank W. Connor married Elvira J. Taylor, daughter of F. B. Taylor. Married Name Her married name was Reeves. Fay Kalish married G. Albert Reeves. Name Variation G. Albert Reeves was also known as Albert. G. Albert Reeves married Fay Kalish. Robert Lee Towery was born on 10 January 1908 at Missouri. He married Hazel Breitzke, daughter of Gustave Julius Breitzke and Anna Sophia Dwars, on 4 August 1956. Robert Lee Towery died on 17 November 1992 at Missouri at age 84 Robert 'Bob' Towery, of Route 2, Advance, MO, died November 17, 1992 at Missouri Delta Medical Center in Sikeston. He was born January 10, 1908 at Lilbourn, MO; son of Garmon and Jennie (Devars) Towery. He and Hazel Breitzke were married August 4, 1956 in Angola, Indiana. Mr. Towery was a pipefitter. He was preceded in death by one daughter, five brothers, and four sisters. Friends may call at Morgan Funeral Home today. Funeral services will be Friday at Morgan Funeral Chapel. Burial will be in Bollinger County Memorial Park Cemetery at Marble Hill. THE CAPE GIRARDEAU (MO) SOUTHEAST MISSOURIAN; 19/Nov/1992. George William Grover married Lucille E. Breitzke, daughter of Gustave Julius Breitzke and Anna Sophia Dwars. George William Grover died on 20 February 1975. 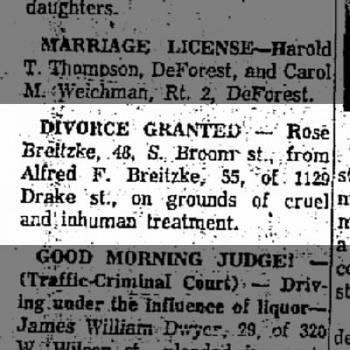 Married Name before 1962 As of before 1962,her married name was Breitzke. Rose (?) was born circa 1914. She married Alfred Ferdinand Breitzke, son of John Michael Breitzke and Augusta Henrietta Breitzke, before 1962. Rose (?) and Alfred Ferdinand Breitzke were divorced in January 1962. Agnes Dickie was born circa 1871 at Alford, Aberdeenshire, Scotland. She was the daughter of William Dickie and Jessie Mitchell. 1901 Backmuir Farm House, Dunfermline, Dunfermline, Scotland Agnes Dickie appeared on the census of 1901 in the household of William Dickie at Backmuir Farm House, Dunfermline, Dunfermline, Scotland. Agnes Dickie was a in 1901 at Dressmaker, Dunfermline, Scotland. William M. Dickie was born circa 1874 at Lough, Aberdeenshire, Scotland. He was the son of William Dickie and Jessie Mitchell. 1901 Backmuir Farm House, Dunfermline, Dunfermline, Scotland William M. Dickie appeared on the census of 1901 in the household of William Dickie at Backmuir Farm House, Dunfermline, Dunfermline, Scotland. Jessie Ann M. Dickie was born circa 1874 at Lough, Aberdeenshire, Scotland. 1901 Backmuir Farm House, Dunfermline, Dunfermline, Scotland Jessie Ann M. Dickie appeared on the census of 1901 in the household of William Dickie at Backmuir Farm House, Dunfermline, Dunfermline, Scotland. Annie Dickie was born circa 1881 at Cawden, Nairn, Scotland. 1901 Backmuir Farm House, Dunfermline, Dunfermline, Scotland Annie Dickie appeared on the census of 1901 in the household of William Dickie at Backmuir Farm House, Dunfermline, Dunfermline, Scotland.